The UN migration agency has recommended that temporary housing be provided to the migrants evicted from a converted cow farm in Qormi last month. Over 100 migrants were evicted by the Planning Authority after it was found that the building had been turned into a place of residence against its permitted use. The migrants were evicted from stalls which “reeked to death”, according to enforcement officer Charles Gafa, who said that the migrants had been living in “inhumane” conditions. The UN migration agency – the International Organisation for Migration (IOM) – expressed deep concern about the “appalling living conditions” the 120 migrants were found to be living in. Noting that it did not have specific information on the individual cases of the 120 migrants on the farm, it said it would “salute the government” if it was to provide temporary housing, in particular to vulnerable individuals. This would aim to safeguard their well-being and allow the migrants a dignified and humane transition phase while a more durable solution was identified, the IOM said. “If managed well, migration should provide States with an opportunity, rather than a burden,” the IOM added. Meanwhile, the United Nations Human Rights Office of the High Commissioner urged a thorough and proper assessment of the migrants’ situation, including an individualised assessment of the migrants’ protection needs and any vulnerabilities. “It is also important that any decision is taken with due respect for their right to housing,” the UN Human Rights Office of the High Commissioner said. “This includes ensuring there are alternative solutions so that they are not placed in a worse situation after the eviction,” it added. According to the migrants, their situation has drastically deteriorated since they were evicted. They had been “so much happier on the farm”, migrants who spoke to The Sunday Times of Malta insisted. Many of them have ended up homeless, while others have gone to the Marsa open centre or moved in with friends. Others have “begged” the landlord to allow them back to the property, now sealed. Two migrants admitted they were looking for an apartment to move into but kept getting turned down. “Someone told me, ‘We do not have space for black people,’ ” he said. “I liked it at the farm, I was comfortable,” said a 24-year-old, who had been living at the Qormi farm for around five months. 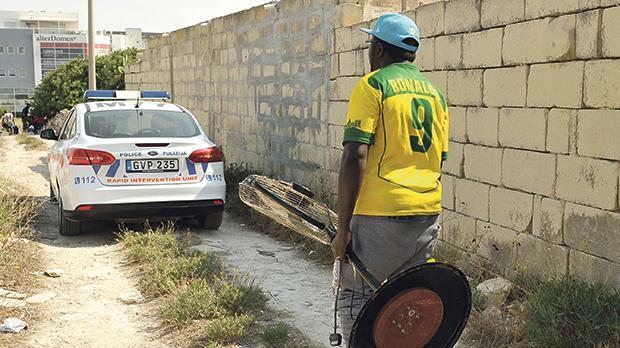 He had spent some time at the Marsa open centre but admitted he hated the area. “There are so many fights that go on there,” he said. “I do not smoke, I do not drink and I do not want to be around that,” he added. When it was pointed out that the PA had found “inhumane conditions” at the farm, the man admitted “it was obvious the conditions were not great, but we were happy”. The Prime Minister announced earlier this month that the government was working on sending the migrants back to Italy. He said they had arrived in Malta legally, flying in from Italy, but that they did not have the necessary permits to work here. In the meantime, three of the migrants told this newspaper they were lying low and hoping the authorities would not target them. Cut off from Maltese society and with no access to news, the migrants were not aware of Dr Muscat’s declaration that the authorities wanted to send them back to Italy. They said they felt as if they were being “targeted”. “I know I have to be careful all the time. If you do one wrong thing, then it’s over. I’m careful about where I walk and what time I am out in the street,” one man said. Another admitted he was “angry” at the revelation. “It is unfair that we have to live in fear every day,” he said.